Five touchdowns in less than 17 minutes. That’s how quickly future Hall of Fame QB Peyton Manning torched the Raiders Sunday, leading the Broncos to a runaway 41-17 win to put the Raiders at 0-9 on the season. Things with the Silver and Black are so bad, they have now lost 15 straight games. Manning went 31 for 44 for 340 yards. He extended his record with at least two touchdown passes in 15 straight games and his streak of 48 games with at least one TD pass is third longest, breaking a tie with Johnny Unitas. There wasn’t much good for the Raiders, and it will be hard for interim coach Tony Sparano to take much positive out of this major blowout setback. 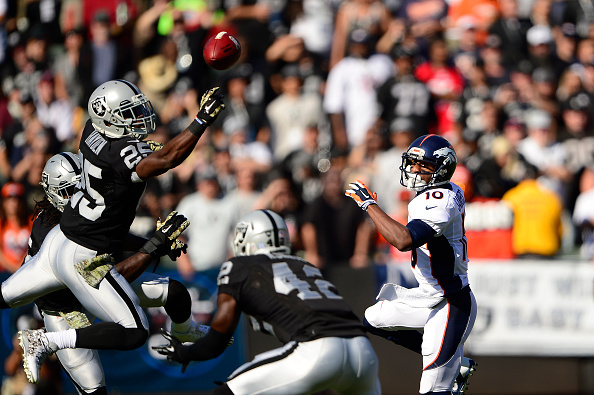 Derek Carr threw for 192 yards, most of those coming late with the Broncos already up 41-10. Carr also had two interceptions in the loss. The running game was limited to 30 yards on 15 carries for the Raiders, who started fast with a DJ Hayden interception on the second play, but fizzled out after taking a 3-0 lead. The 41-yard field goal by Sebastian Janikowski gave the Raiders their first lead against the Broncos since Tim Tebow was the Denver quarterback in 2011. It took Denver some time to get into it, but once they did, they trampled the Raiders, going up 20-10 by the half, and never looking back.